If you have made an informed choice not to support animal testing, you might now be interested to find an organisation that is focused on activities that work to stop animal testing. There are numerous organisations within the United Kingdom (UK) and around the world, often multi-office global ones. These organisations educate and campaign against the government, private companies, contract research organisations and universities to express their anger and discontent with animal testing. PETA is an animal welfare group that is based out of the United States. It has almost two million members and supporters worldwide. It is one of the largest - if not the largest - animal rights organisations in the world. It initially began in 1980 and is classified as a non-profit organisation. Despite it being based in the United States, it also has offices in Canada, France, Spain, India and many other countries. PETA' s stance is one that appreciates animals as pets and companions but maintains that they should not be eaten, worn as fur, used for entertainment purposes or for animal testing. PETA runs numerous campaigns, which have received strong criticism for their aggressive approaches through advertisements and protests. The BUAV is based in London and their aim is to have all animal experimentation stopped. They partake in a great deal of undercover investigations in laboratories and they also focus on education and research. The BUAV is a strong supporter of alternatives to animal testing and is generally respected for their approaches and work in this area. 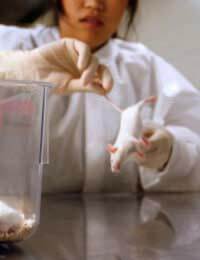 SHAC is strictly focused on animal testing at the Huntingdon Life Sciences (HLS) laboratories, which are one of the largest in Europe. HLS is a contract research organisation that kills approximately 75,000 animals each year. They perform testing for an enormous range of clients and purposes, which include chemicals, pesticides, cosmetics, foodstuffs and drugs. Although SHAC began nearly a decade ago in 1999, they have become a somewhat aggressive animal rights group. In the early days of the organisation, they obtained undercover footage of staff hitting and shouting at animals. Employees involved in the incident were ultimately dismissed and the consequence was that HLS had their license temporarily suspended for animal testing over the course of six months. In one sense, SHAC took over where PETA left off with regards to HLS. PETA historically had staged many protests against HLS but after they were threatened with legal action, SHAC essentially moved in with no concern or regard for legalities. Their mission was a clear one and no threats regarding legal action would sway the organisation. At the same time, other organisations have described SHAC's tactics as extreme and dangerous. SHAC also added fire to the impact by making statements indicating that any person associated with a company that had any connection to HLS would be identified by SHAC and would have their property destroyed. If you do decide to take part in an organisation that is against animal testing, it is still wise to be cautious and stand your ground if you are pressured to take part in any illegal activities. Some extremists will resort to threats, violence and overtly aggressive tactics, which only paints activists in a poor light rather than actually making a positive difference in the treatment of animals. Respectful but confident activism can ensure that your message is heard clearly and that it is ethically communicated. I wanna fight back! Brighton uk contact me. @kezza. No unfortunately this is not the sort of information we can provide on this site.